After lunge research we identified the world’s most beautiful railway stations also on the basis of personal experiences. I hope you enjoy this selection of the most beautiful train stations around the world. Texts from wikipedia.com Have fun! 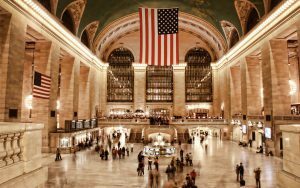 Grand Central Terminal (GCT; also referred to as Grand Central Station or simply as Grand Central) is a commuter, rapid transit (and former intercity) railroad terminal at 42nd Street and Park Avenue in Midtown Manhattan in New York City, United States. Grand Central Terminal has intricate designs both on its inside and outside. In addition, it contains a vast interior main concourse. The terminal is one of the world’s most visited tourist attractions, with 21.9 million visitors in 2013. Liège-Guillemins railway station (IATA: XHN) is the main station of the city of Liège, the third largest city in Belgium. It is one of the most important hubs in the country and is one of the 3 Belgian stations on the high-speed rail network. The station is used by 15,000 people every day which makes it the eleventh busiest station in Belgium and the third in Wallonia. 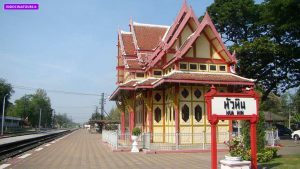 Hua Hin Railway Station is a train station located in Hua Hin Subdistrict, Hua Hin District, Prachuap Khiri Khan Province, and is located 212.99 kilometres (132.3 mi) from Thon Buri Railway Station. It is a class 1 railway station on the Southern Line. On the premises, there is an old 305 Unit Baldwin steam locomotive on display. Hua Hin Station has been considered to be the most beautiful station in Thailand. Kanazawa Station (金沢駅 Kanazawa-eki?) 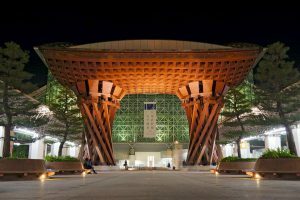 is a major railway station in Kanazawa, Ishikawa, Japan, operated by West Japan Railway Company (JR West), the private railway operator Hokuriku Railroad, and the third-sector operator IR Ishikawa Railway. 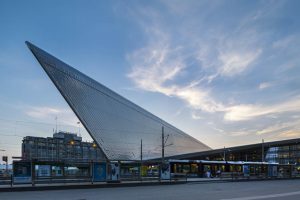 Rotterdam Centraal is the main railway station of the city Rotterdam in the Netherlands. The station received an average of 110,000 passengers daily in 2007. The current station building, located at Station Square, was officially opened in March 2014. 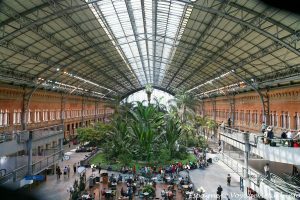 Madrid Atocha the largest railway station in Madrid. It is the primary station serving commuter trains (Cercanías), intercity and regional trains from the south, and the AVE high speed trains from Barcelona (Catalonia), Zaragoza (Aragon), Seville (Andalusia) and Valencia (Levante Region). These train services are run by the Spanish national rail company, Renfe. 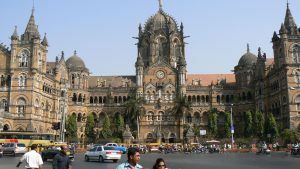 Chhatrapati Shivaji Maharaj Terminus (CSMT), formerly Victoria Terminus (VT), is a historic railway station and a UNESCO World Heritage Site in Mumbai, Maharashtra, India which serves as the headquarters of the Central Railways. Designed by Frederick William Stevens with influences from Victorian Italianate Gothic Revival architecture and traditional Mughal buildings, the station was built in 1887 in the Bori Bunder area of Mumbai to commemorate the Golden Jubilee of Queen Victoria. The new railway station was built on the location of the Bori Bunder railway station and is one of the busiest railway stations in India, serving as a terminal for both long-distance trains and commuter trains of the Mumbai Suburban Railway. The station’s name was changed to Chhatrapati Shivaji Terminus in March 1996. The Southern Fuegian Railway or the Train of the End of the World (Spanish: Ferrocarril Austral Fueguino (FCAF) or El Tren del Fin del Mundo) is a 500 mm (19 3⁄4 in) gauge steam railway in Tierra del Fuego Province, Argentina. It was originally built as a freight line to serve the prison of Ushuaia, specifically to transport timber. It now operates as a heritage railway into the Tierra del Fuego National Park and is considered the southernmost functioning railway in the world.